If you’re looking for something to do in a leisurely manner on a Sunday in Yellowknife, often you can find it at the Prince of Wales Northern Heritage Centre, better known as “the museum”. It’s the perfect place to pop into on a Sunday afternoon, to take in the latest exhibit, or whatever is happening at the time. You can learn something or be entertained, or both. This month I popped in one Sunday to take in the play “A Taste of the Wildcat”. The Wildcat Cafe is a landmark and an institution in Yellowknife, an eatery dating back to the early days of this mining town. (See it and other landmarks here) Anything with that kind of history has seen more than its share of characters pass through its doors and heard many a tall tale told. The play was a series of sketches of northern events, both simulated and actual. So dear is the Wildcat to the hearts of Yellowknifers that the old log building was refurbished and opened last summer for meals, music and generally good company during the summer months. Perhaps some of the goings-on nowadays will one day provide material for future performances of the play. 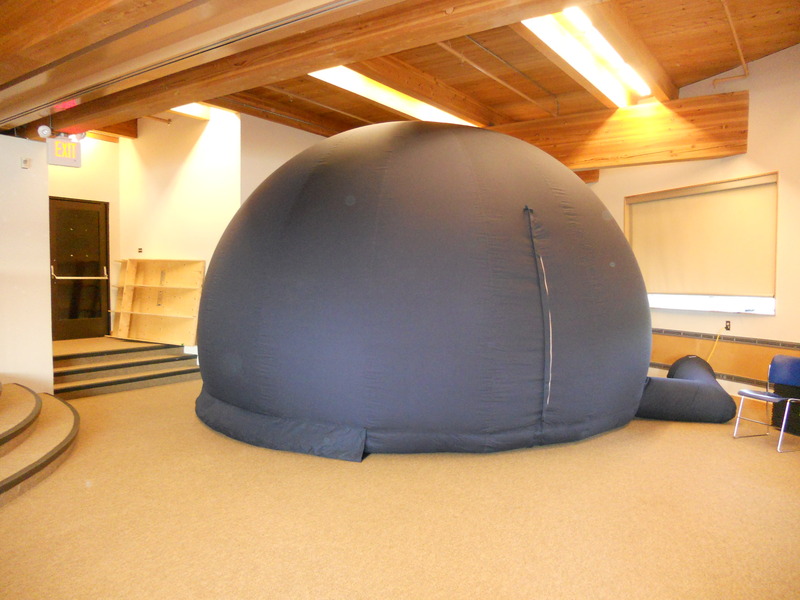 Staff of Parks Canada paid a visit to the museum this month, bringing along their Great Northern Discovery Dome, a portable planetarium. They came to educate about national parks and Dark Sky Preserves – regions with no light pollution that are accessible to the public – specifically about Wood Buffalo National Park. This park sits in both Alberta and the Northwest Territories and it’s significant for many reasons, among which are: it’s a UNESCO World Heritage Site, the largest national park in Canada, and the largest Dark Sky Preserve in the world. The dome was made of a dark blue fabric, into which air was pumped to blow it up big enough to easily fit about 25 people. It had a zip-up entrance much like a tent, and we had to be quick about your entrances and exits, otherwise too much air escaped and the top of the dome sagged. Inside the dome it was dark, to mimic dark skies. We were treated to a presentation about the park, including of its changing skies. Without light pollution, the constellations are easy to see, as are the aurora borealis. The park is immense – almost 45,000 sqkm. It was established in 1922 to protect the last remaining herds of buffalo. Today there are some 5,000 wood buffalo that call it home. So do wolves, which prey on the buffalo, yet the numbers of both populations have remained steady. It just goes to show that nature can keep its own balance when humans don’t interfere. Other animals that roam the park include bears, moose, lynx, marten, wolverines, foxes, and beavers. The beavers there must be a rather busy lot, because they’re supposedly responsible for the world’s longest beaver dam. the Peace-Athabasca Delta – three river deltas and large freshwater lakes that are key nesting and feeding grounds for migrating birds. the Whooping Crane Summer Range -thousands of lakes, bogs, marshes, ponds and streams that make up the only remaining natural nesting ground for endangered whooping cranes. Aside from the dome, there were various items on display, including animal bones and skulls. 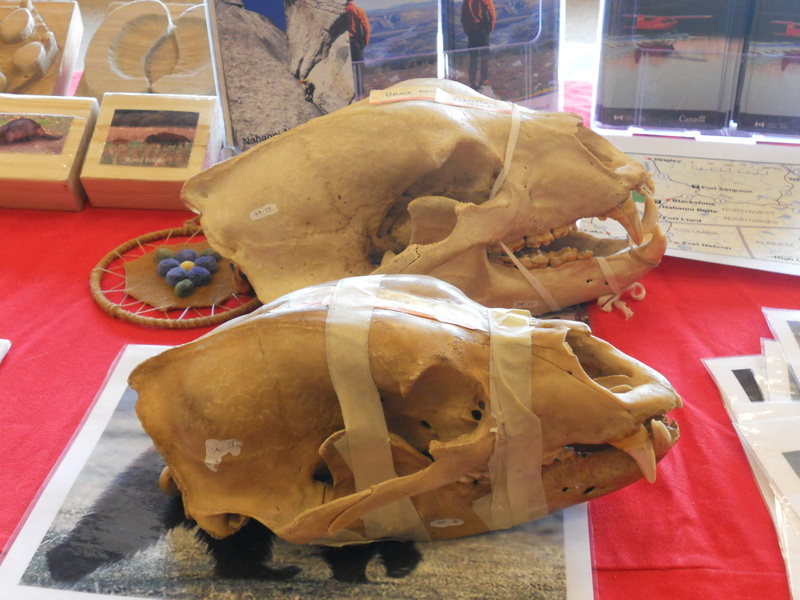 I was surprised to see how much bigger a grisly bear skull is than a black bear’s, and that they are very similar in shape, although the faces of the two animals are not. Back to everyday life in the ‘Knife. Recent chilly days and the need to put the lights on earlier at night make it impossible to deny that the summer’s winding down. A few days of much-needed rain have quelled the smoke from the forest fires, if not the fires themselves. Exhausted firefighters who came from other provinces and states to help are finally being allowed to go home. I don’t think I’m alone in trying to wring everything that I can out of these last days of life as I prefer it to be. I refuse to give up on wearing shorts, even though on some days it’s warm enough for only a few hours. My body can handle slightly cold legs in the late afternoon better than my mind can deal with the thought of soon having to don multiple layers of clothing at all times of the day. One rite of summer, a farmers market, has been running every Tuesday after work outside of City Hall. The growing season here is very short, but the long hours of sunshine make things grow quite fast. There are lots of enthusiastic gardeners here, and community gardens to accommodate those who don’t have the necessary backyard space. I made my way over to the market on a smoke-free but semi-cloudy day. There was lots more than mere produce on sale. 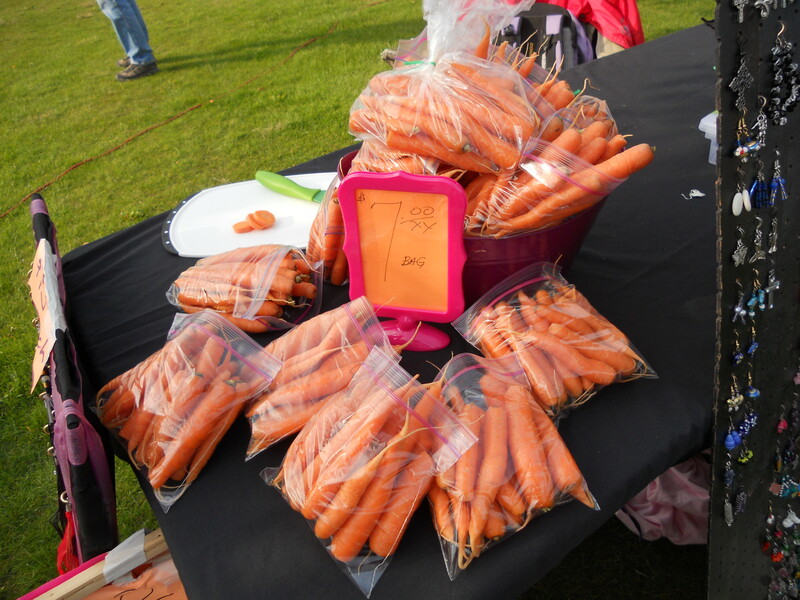 The first set of people I saw were waiting to buy dumplings at one stall, right next to a stall offering both carrots and jewellery. For those who were hungry after work, the market provided an excuse to stop for a bit rather than rush home, because you could pick up a meal on the spot. 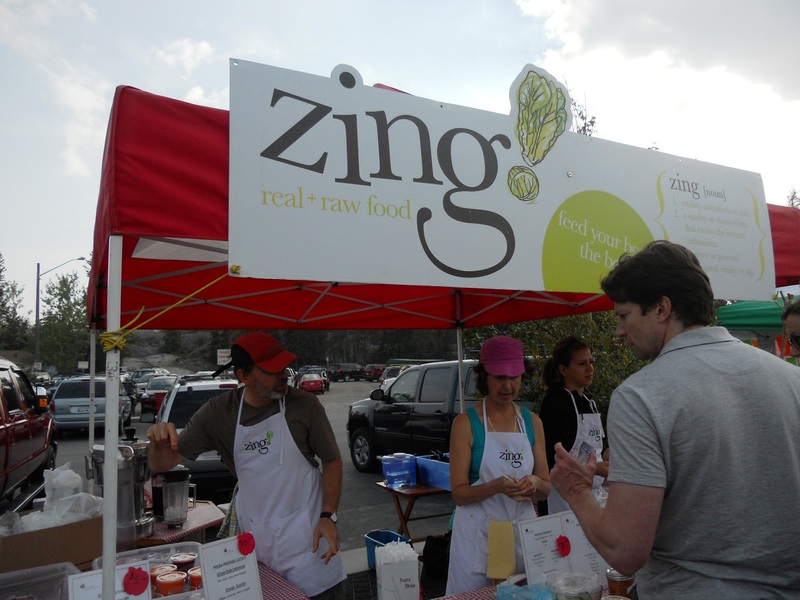 There were stalls with delicious curries, freshly-baked breads, desserts, jams and preserves, and even raw foods and juices. You could buy tonight’s dinner and dessert, bread and kale for tomorrow, and socialize at the same time. 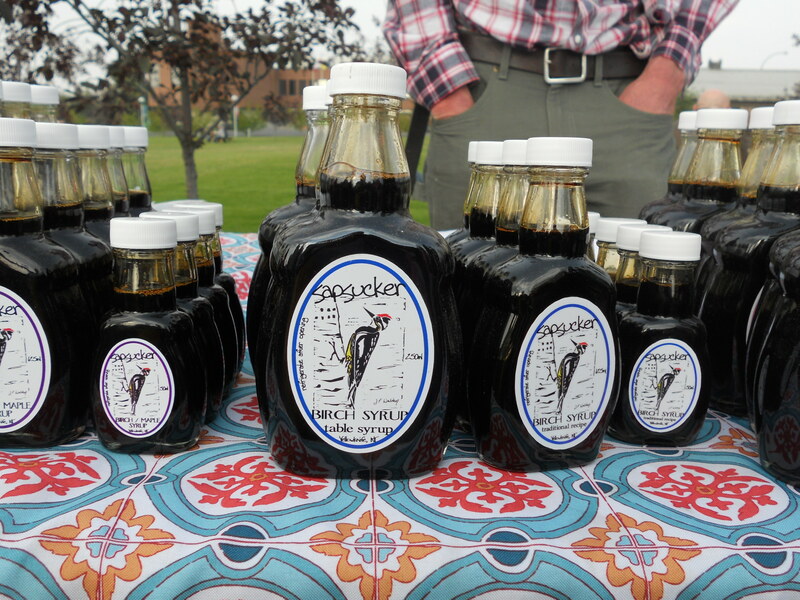 I came across a table lined with bottles of birch syrup, sold by someone from “birch syrup central”, i.e. the sugar shack in the woods that I visited back in May. Perhaps the 4 or 5 buckets of birch sap that I had helped to collect had been boiled down into one of those very bottles of birch syrup on the table. Yellowknife: where it’s possible for you to know where your food comes from, where it could be from your neighbour, or you might even have played a tiny role in its production. The farmers market ends on September 16th. I can only hope against hope that my shorts-wearing days will last that long.